We work through the year to spot and book bands, search for the best sound & light partners, optimize every little aspect of the festival,... We strive to offer a surprising line-up on two highly professional stages with the best sound and light set-up we can get. Besides that we also make sure our visitors can enjoy a cold Belgian beer, served by our happy volunteers. The catering team goes out to buy the best ingredients to make classical local dishes or more exotic plates and of course our Belgian Fries boys are there to serve the best fries in town. Free breakfast and coffee during the festival means everyone is prepared for the day. These are the perfect ingredients to build an excellent reputation in the whole world and attract enthusiasts of the music scene from all over the world. The fact that we are one of the few festivals who are brave enough to focus on post-rock and related genres is in favor of that reputation. 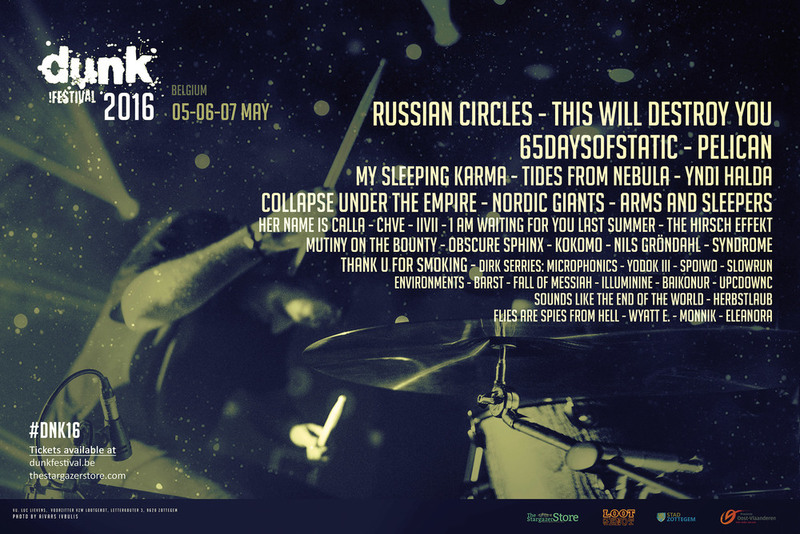 We can count our EU post-rock festival conspirators on one hand and we're not sure if we need a second hand to count them world wide. 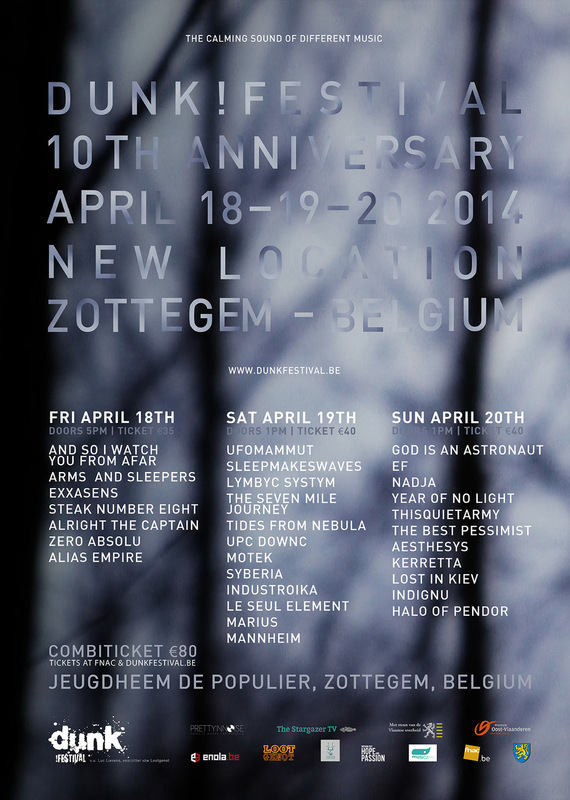 We're often referred to as the biggest post-rock festival in Europe (and even the world). 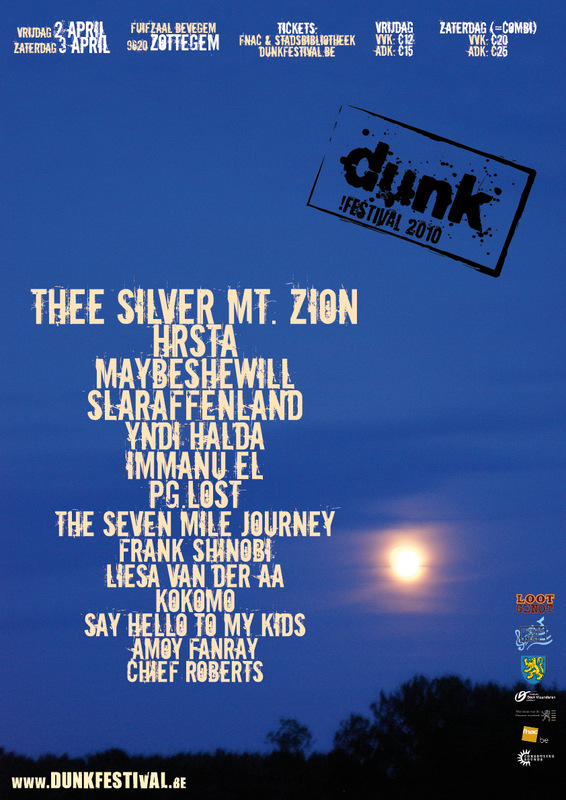 "dunk!festival... probably stands as the world's only major festival with a consistent, primary dedication to post-rock music." From the book Storm Static Sleep: A Pathway Through Post-Rock by Jack Chuter. In Fall 2017 we will set up the first US edition of our tiny festival in Burlington, Vermont with the help of A Thousand Arms (who is also distributing our releases overseas). Besides offering a stage we also support a small selection of bands in releasing their albums. Since 2011 the label releases 10 to 15 albums a year on vinyl. The label believes in a DIY philosophy and is a one-man-operation. Of course high quality is also extremely important in this project. Vinyl is (almost) always pressed on heavy 180g vinyl and most albums have upgraded cardboard covers. 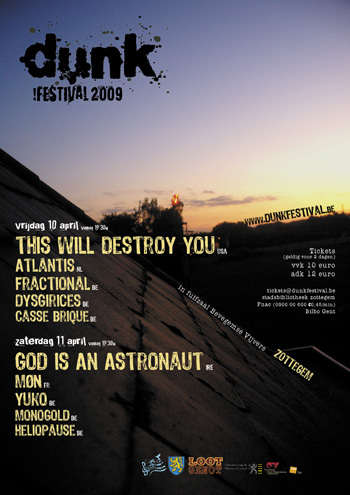 A festival also running a label results in the live albums recorded at dunk!festival and released on dunk!records. Because there are more great bands than we can put on our stage or release on the label we created a webshop to support more bands in spreading their music. It has all dunk!releases but also a whole bunch of other handpicked albums. So it could be seen as our own private album collection we share with you. All albums are bought from the bands themselves or their independent labels. That way we, and our customers, fully support the scene. Records are shipped to all EU countries and the USA. Since early 2017 you are able to come and say hi in our actual dunk!store in Ghent, Belgium. 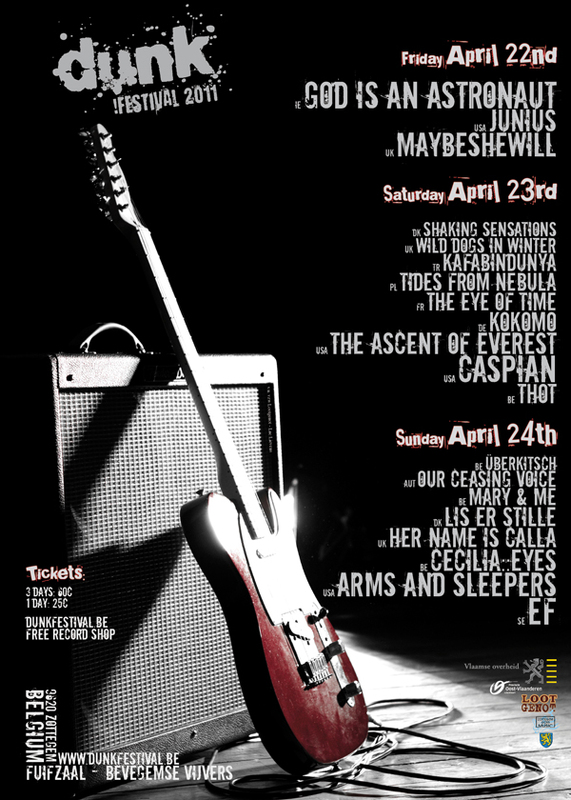 This year we present 44 bands on 3 stages in 3 days. 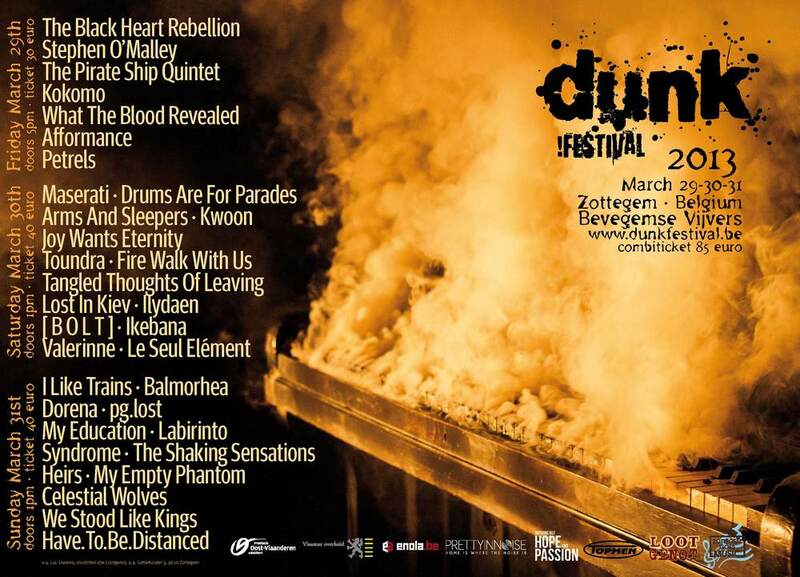 To be precise: May 25-26-27th in Zottegem, Belgium. We will set up our tents on the same location as usual, right next to De Populier. The Main Stage tent will be a lot bit bigger this year and have the merch area inside! The Stargazer Stage will be set up on the other side of the building, next to the food square. New this year is a real forest stage with 3 shows a day. Also this year there is the possibility to book a Flexotel. It's a mobile hotel room with 2 or 4 beds, including towels, electricity and everything. They will be set up at the festival. Of course it's still possible to just bring your tent and set that up at the camping site right next to the festival. In 2013 we didn't succeed in that, at all... But with the support of our loyal fans we survived and kind of reborn on a new location since 2014.